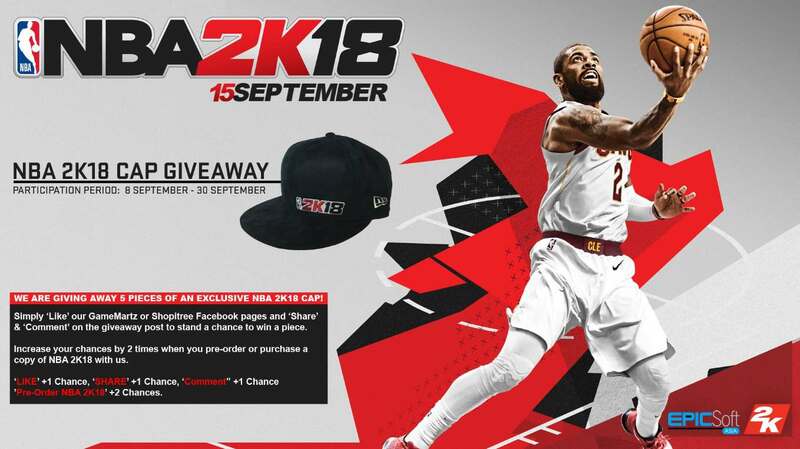 Simply ‘Like’ GameMartz or Shopitree Facebook page and ‘Share’ & ‘Comment’ on the giveaway post, and stand up to 5 chances to win 1 NBA 2K18 Cap. P/S: Please set your post to ‘Public’ when sharing this picture. By doing so, we will be able to see who has shared the giveaway picture. The chance will not be added if we cannot see your share post. [Step 3] ‘COMMENT’ the post – who is your favourite Basketball Team and Player? [Step 4] Increase your chances by 2 times when you pre-order or purchase a copy of NBA 2K18 with us. Find out more at GameMartz.